one of my favorite seasonal things is "special editions" of brands that I already love. spice cake candles & deep romantic burgundy nail polishes make for fun fall treats. do you have any fall favorites that are "special editions?" Ooh, that nail polish looks delightful! I'm a fan of essie. Pumpkin spice creamer and lattes!!!! Yummy! I love fall/winter for Starbucks Joy tea! mmmmm...delish. Pumpkin spice lattes definitely and any sort of pumpkin or apple scented candle. Also I love Williams Sonoma's fall hand soaps. Oh I had no idea they did seasonal candles. Now I want one! I love this photo. I'm a big Essie fan. Can't wait to find one of those candles! I'm a huge fan of the OPI fall edition nail colors! Can't wait for them every year! Carry On is my new fave...I have it on my toes and love! 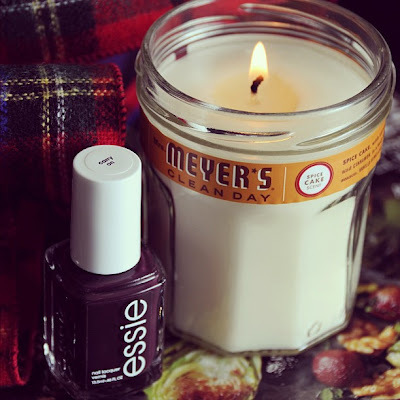 I am dying to try one of the darker, more purple nail polishes from essie!